Professor: Welcome to this Blog and a look at topics for June 2013 thru September 2013. Overall, the goal is to get deeply involved with Perception and Regulation of Endurance Performance. Student: How deep is deeply involved? Professor: How deep in physiology? Or how deep in psychology? Student: Proske & Gandevia (2012) are physiologically deep. between proprioception, vision, and vestibular inputs. Professor: I am guessing that they do not want to discuss “perceptions”. Student: So you have found a lot of gold nuggets in all these posts. In this post I’ll dig into the first three groups and save The Sense of Effort group for the initial post of next trimester. Professor: A hugh gold nugget is from the second post, NOPE; Spinal Interneurons are NOT Activated In A Graded Manner. This dropping out of interneurons is the nugget found by McLean et al. (2008). The graded recruitment of motoneurons continues to be a universal phenomenon. 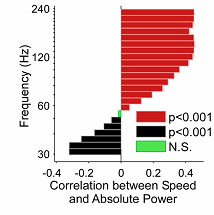 However, different locomotor speeds involve some shifts in the set of active interneurons. Some interneurons active at slow speeds are silenced at faster ones and this pattern occurs both within and between excitatory classes. Student: The active set of interneurons continuously shifts with changes in speed for the zebra fish and perhaps as a general principle for all vertebrates. Does this happen with fatigue? Professor: Very intriguing question, and the answer(s) I hope will come in the next set of posts. Student: “What Is the Primal Movement Starter?” Classy title; how come the term “primal”? Professor: Consider escaping from the sabertooth tiger as an ancient survival tactic. The Trigger Command Neuron is even found in a primordial creature like the leech. Student: How many blog posted this year? Professor: This is the 14th. Student: Can you remember the topics for the first couple of posts? Hey, I know you’re retired, and I am not suggesting you getting senile. Professor: Well, I’m guessing they were about locomotion. Maybe the next post could be a review of these posts. And how often would a review be advisable? Could the years be divided into blocks? Student: I like looking for blocks of posts. Indicates to me that the website isn’t scattered, just doing random ‘shoot-from-the-hip’ postings. Professor: Me too. How does publishing on a trimester basis seem to you? Student: Superb. And the last month would have catch-up time. Professor: You’re right in the bulls eye. Take Home: Next Endurance-Education Blog Trimester will be June 2013 – September 2013. Next for February – May 2013: Review of the recent Blog Posts with the challenges for next trimester. Student: Figure 11 in Proske & Gandevia (2012) is fixed. I used plurals and changed Motor Command to Motor Commands and Efference Copy to Efference Copy Signals! Professor: Attaway. Nice quick thinking. Student: And where do the Efference Copies go? 4) from the frontal cortex and going via the pontine nuclei to the cerebellum. Student: What a pile of articles! And what did you find on commanding movement? What are the types of movements? What is the nature of the network(s) for motor command? Gross motor movements, like doing deep knee bends. Voluntary actions, like switching to a different trail when running in the woods. Professor: Now, what kind of motor command is involved with each? Student: Interesting! Is this a trick question? I thought that the only motor command is from Betz cells sending discharges down the corticospinal pathway. Student: Proske and Gandevia in 2012 described an exafferent component as the “afferent signals generated by stimuli of an external origin”. Professor: Well said; almost an exact quote. Student: For me, running is mostly automatic, overlearned, rhythmic movement. How come I have no Sense of Effort during long periods of slow, easy running? Professor: The simple answer is there is NO mismatch according to the theory cited byProske & Gandevia. That is, no error exists between the efference copy and the signal from motor command at the ” ‘difference’ calculator “. Proske & Gandevia further down the legend state, “if the predicted and actual sensory feedback match, the anomalous situation arises where there is no perception at all”. Are they referring to voluntary contractions, perhaps using fine motor control or learning a gross motor pattern? Then again, there are well over-learned, automatic movements like running! Is jogging through the forest in Germany, only noticing the holes dug out by WWII bombs, just an ‘anomalous’ situation?! Professor: Very interesting and intriguing questions. Then the answer is a sense of effort is to have A Mismatch! Student: And what is the “motor command”? What if during some or many walking or running or cycling strides, no motor command signal was ‘issued‘? Or is there always a command signal coming down the efferent nerves to the active motor pool? Professor: Let’s do some digging into the History of Motor Command and Control of Muscle Recruitment. Maybe we can find the answers to those questions, or at least get the ‘dogma’ scientists state about command signals. Proske U, Gandevia SC. (2012) The proprioceptive senses: their roles in signaling body shape, body position and movement, and muscle force. Physiol Rev 92: 1651–1697. Student: Your post for October 15th, 2012 had the title, “What is meant by Effort or Exertion?” Have you gotten any clues? Professor: Well, as a matter of fact I reread that Post, and I found a review article by Prostke and Gandevia (2012) that have provided some much needed insight. Professor: Notice that effort for me was not conscious until I had to focus on my running. My research on effort had biased my ‘noticing’ to look for only a “motor command”. How does the Motor System correct walking errors? Student: Wow, was I ever slipping and sliding, just trying to walk outside. It was a street with patches of ice: step, step, slide, step, sliiiide, …. Professor: My walking was off today, too. I was limping from sore knee like walking in a wooden leg: step, thump, step, thump, …. Student: I noticed I was got ‘off balance’ but without thinking I never fell down. Professor: Hmm. We could be correcting for perceived differences, i.e., errors, like from where we were supposed to be walking to actually where we were walking. Student: How can we measure the error between what is expected and what is actual for walking? Professor: The legend for their Fig. 2 shows these important parameters. The Stance Time for the ‘slow’ leg (STs) is from Heal Strike (HS) to Toe Off (TO) of the slow limb; vice versa for the ‘fast’ leg Stance Time (STf). Double Support for the slow leg (DSs) begins at heel strike for the fast leg and lasts until toe-off for slow limb; vice versa for the fast leg. During Stride Time for the slow leg, its Step Time (ts) lasts to the beginning of Double Support; vice versa for the fast leg (tf). 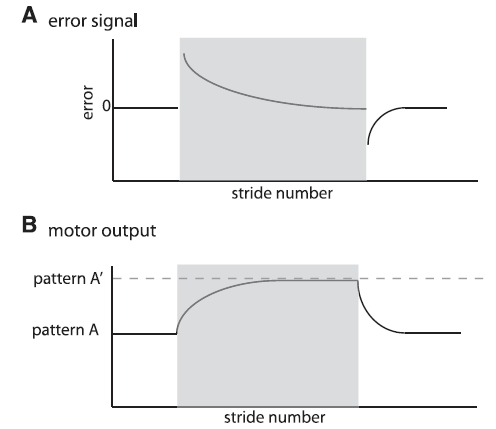 Stride Time (Tstride) for either leg was the difference in time from heel strike to the subsequent heel strike. Student: Ough, I hurt my left knee running this week. And it’s hard not to be limping. It’s sorta like walking on a split-belt treadmill! FIG. 1. A: diagram of marker location and limb angle convention. 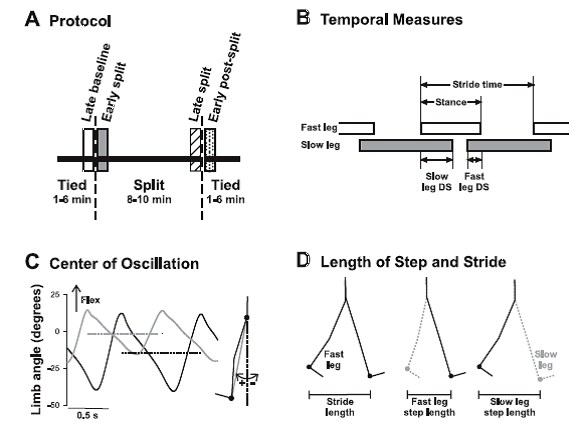 B: experimental paradigm showing the periods of split-belt walking and conditions. “Subjects in the control group were given no instructions (n = 11). “The conscious correction group was given on-line visual feedback of their steps and instructed to “keep their step lengths equal on both sides” during the entire adaptation block (n = 11). To allow subjects to develop their own error monitoring and correction mechanisms, the experimenter demonstrated what was defined as a step length until the subject had an understanding of the parameter, but allowed the subject to monitor his/her own errors (i.e., the experimenter did not comment on the step lengths) once the experiment began. Student: How young can a child be…. Well, how well coordinated can a child be so it can adapt to walking on a split-belt treadmill? Ahh, with a minimum of assistance? Click link to read more. Does Our Brainstem select Our Motor Programs? Eh! What? Motor programs operated by the brainstem? Okay, my brainstem is the extension of my spinal cord. And I’m guessing this means just my brainstem selects each motor program I use? Well, the short answer is Yes and No. Let’s allow the experts to explain! What Happens When I Switch from Walking to Running? Before I was retired, I used to take the bus to work. One day, when I am walking toward the bus stop, I saw my bus already pulling up to my bus stop, and I noticed, in a moment later, that I was off and running toward it. Later on, I realized in that brief moment, I had made an abrupt and radical switch from walking to running. FIG. 1. General characteristics of walking and running. A: schematic representation of walking by vaulting (inverted pendulum) and running by a “bouncing” gait (leg spring-loaded behavior during stance). B: ankle, knee, and hip moments of force and vertical ground reaction force (normalized to the subject’s weight) of the right leg during overground walking (5.4 km/h) and running (9.4 km/h) in 1 representative subject. C: relative stance duration and cycle duration (± SD) in walking and running. D: foot (fifth metatarsophalangeal joint, VM) trajectory characteristics (mean ± SD, normalized to the limb length L): horizontal excursion of the VM marker [relative to greater trochanter (GT)] and vertical VM displacements (in the laboratory reference frame). Click here to keep reading this post. Primitives. Hey! What do you mean by “Primitives”?! Thus, these primitive building blocks can be hypothesized to define modules of muscle activations that are a combination of basic patterns and weights distributed to the muscles composing the module (see Lacquaniti et al. 2012). Fig. 1. (A) Schematic of motor modules (m). Simulated example of muscle activity profiles as weighted (w) sum of basic patterns (p): mi(t)=Σjpj(t)wij. The outputs of the first (green), second (blue), and third (magenta) modules are summed together (i = 5, j =3) to generate overall muscle activation (black envelope). (B) Illustration of a step cycle in a 3-day-old newborn. Click to keep reading this post! 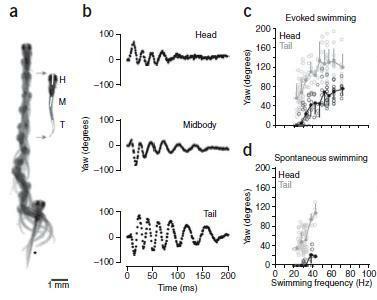 Then, are the active set of spinal interneurons graded during increases in swimming speed? NOPE!!!! Figure 1 a-d. Analysis of real and fictive evoked swimming movements. (a) Consecutive overlapping images of a bout of swimming elicited by a tactile stimulus to the tail (at asterisk). A frame extracted from the montage (gray arrows) shows the regions selected for kinematic analysis at the head (H), midbody (M) and tail (T). Images were captured at 1,000 Hz (images 1–9, every 4 ms; 10–12, 8 ms; 13–14, 16 ms; 15–18, 32 ms). (b) Automated analysis of yaw at three points along the body, from the bout in a. Only the tail showed any noticeable movement at the end of the bout, when swimming was slowest. (c) Plots of head and tail yaw from 12 evoked swimming bouts in 12 larvae. The degree of head and tail yaw decreased as a function of swimming frequency. Open circles are raw data points, whereas closed circles represent means (± s.d.) from data binned at 5-Hz intervals (for example, 15–20, 20–25, etc.). (d) A similar plot for spontaneous bouts of swimming (12 from the same 12 larvae), whose values are comparable to the lower end of evoked swimming frequencies. Only the first episode of the five analyzed in each fish is shown in c and d.
What Is the Primal Movement Starter? There is no doubt that escaping capture was critical to survival. So, what starts escape and also other forms of movement? Let’s start by looking at a primitive animal: the leech. Escape for the leech is swimming, as long as it is in relatively deep water. A tap on its tail will result in fast swimming! How does a leech swim? It creates an approximately sinusoidal, undulatory traveling wave. Contraction and relaxation of dorsal and ventral longitudinal muscles are primarily responsible for swimming undulations (Lamb & Calabrese, 2011). NOTE: for scientists, there is neural activity ‘sign’ that an isolated or nearly isolated leech preparations would be swimming if it was in an intact leech. The ‘sign’ is a bursting pattern of a dorsal excitatory motoneuron in these preparations, and the behavior is called “fictive” swimming. Researchers frequently refer to “fictive swimming” as a “swim”, “swim episode”, “swimming”, and “swim activity” (Mullins et al. 2011a). What are the pathways activated in these muscles? At the base is a central pattern generator (CPG) circuit that is composed of complex segmental oscillators which rely heavily on intersegmental connectivity (Lamb & Calabrese, 2011). Midbody ganglia contain a bilateral, triphasic oscillator CPG circuit composed predominately of bilaterally paired interneurons. And the output from these oscillator interneurons controls the activity of the excitatory and inhibitory motoneurons. It is these interneurons that provide the final common pathway to the longitudinal muscles used for swimming. Otherwise, a leech is simply resting. What is/are the Primal locomotor initiator(s)? And where is it/are they located? Does the recruitment of spinal interneurons increase according to the motorneuron cell size principle? How are the recruitment of muscle patterns, i.e., muscle synergies, involved for postural changes during locomotion? Is the midbrain reticular formation or basal ganglia directing any change in motor pattern selection? What senses muscle force exerted during locomotion? What senses pain? What senses exertion especially during high intensity sport? How does the estimation of the sense of force, pain, exertion, and effort become reported? And how is exertion sense used in producing a specific work rate? What increases the rating of perceived exertion (RPE) during a constant work rate? Is the mechanism related to the Central Governor Model? Second, the increase in RPE(Delta RPE) will be explored as a Critical Limiting Factor for prolonged endurance. That is, is Delta RPE a Critical Limiting Factor? Or, what are associated with Delta RPE that are Critical Limiting Factors? Also, this means an updating of the background Pages about Limiting Mechanisms, and in the process of updating, perhaps writing a Review Page about Delta RPE and Critical Limiting Factors. Third, preparations will be made for the next series of blog Posts exploring the mechanisms for pain and fatigue. Fourth and last, steps will be taken for improving the sharing of this website’s Pages and Posts. Bending the Mind or Minding the Bend? So onto the black cinder track at the U of Washington, we went. Off on the first interval I ran smoothly straight at the first curve, just before got ready, and then felt the lurch to the left, leaning into the curve, and pushing a bit harder to stay up with the others. We glided through the curve, just before the back straightaway got ready, and then felt becoming relaxed, so to speak, to run smoothly straight toward the next and last curve. 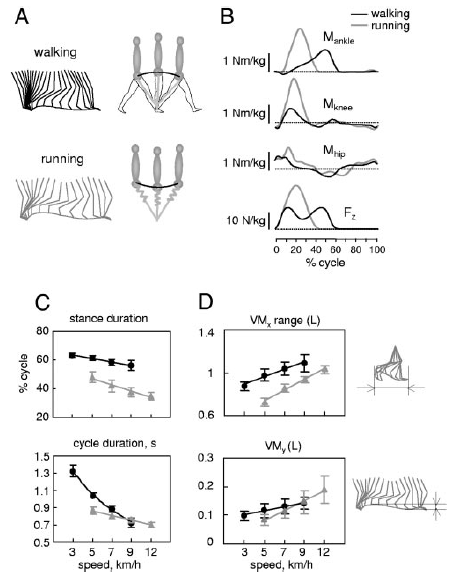 Now that I think about last week’s post, ” When you run fast, your brain works harder,” I am still struck with the finding that when leg power in increased, so is hippocampal gamma oscillation power. So what is driving the hippocampus? Ahmed and Mehta surmise it is maybe visual and vestibulatory output. And what happens when you run or even walk around a curve? How do we actually run harder? What kind of a neural network helps to run faster? “… Today we’re going to talk about a paper that may have worked out a tiny piece of how the brain might deal with things like increased speed. How does your brain keep up with your feet? By running a little faster. To understand how this works. We need to talk about two major things: place neurons, and oscillatory networks. Place neurons are just what they sound like. In the hippocampus, certain cells will fire in response to certain places. When you record cell firing from a rat’s brain with an electrode array, you can actually see and hear the neurons firing as a rat looks around a place it has been before (and this is definitely one of the awesome and defining moments of a young neuroscientist), certain neurons will fire for, say, the left corner, and others will fire for the bottom right. But here’s where we get to oscillation. You see, a neuron doesn’t fire alone. It fires repetitively with large numbers of nearby neurons, in turn triggering other neurons to fire, resulting in a firing network of neurons. These networks fire at certain frequencies and patterns, which we describe by their frequencies, with names like theta and gamma and beta. The question is, how do things like place cell firing and neural oscillations vary as you move? The authors of this study wanted to see just how place cell firing varied as a function of an animal’s speed. To do this, they hooked electrode arrays into the hippocampi of rats, and watched the oscillations of their place cells as they ran a maze. They set up a nice large Y Maze, with rewards at all the ends, and let the animals run it as fast as they wanted. They looked to see how the activity in the hippocampus varied as a function of speed. “And this is an important thing to think about. Because, if you’re running FASTER, you have to determine where you are [FASTER] as well! This means that you’ll need to process your spatial information faster. How do you do that? Well, the authors propose two options. First, you could leave out bits of spatial recognition processing, skipping certain elements so you only get the most essential information. But you could also just…run the whole spatial processing sequence faster. And the authors hypothesize that this second option may be the right one. The increased gamma oscillations that correlate with speed are how the animal keeps up with its own feet, processing spatial knowledge faster as it runs faster. The faster transitions might allow the hippocampal cells to encode place no matter how fast you’re going. And exercise psychophysiologists, too! 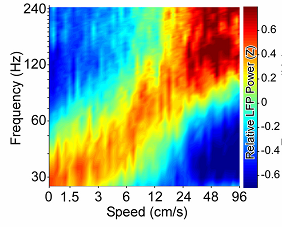 Very intriguing that more leg muscle cell power used is associated with more hippocampal place cell power. Tune back in next week when the topic is Minding the Bend. About the Scientific American Post Author: Scicurious is a PhD in Physiology, and is currently a postdoc in biomedical research. She loves the brain. And so should you. Follow on Twitter @Scicurious. These runners are the Same at what. When taking steps, or running strides, they are the same. How come? By counting their steps! Jack was Keynote Speaker at the First Annual Meeting of the RMC, ACSM. I happened to be one of the three co-founders of this Regional Chapter. We chose to have the meeting on the two days before the Las Vegas Marathon. More importantly, after the meeting, many of us gathered near the finish line with the spectators. Jack said something like, “I wonder what we could learn from this marathon! ?” After hemming and hawing, we decided to investigate stride length as a function of race speed. METHOD: We noticed a series of telephones poles on the road across from us that the participants took just before they made a right turn and came straight at us for about 200 meters to the finish line. A pair of poles were selected that were the third and fourth from the turn. Which of the marathoners should we pick? Our sample were 10 of the leaders, 10 at the beginning of the main pack, 10 near the end of the main pack, and 10 who were jogging to the finish near the last of the participants. Our null hypothesis was that the faster runners would have a faster stride frequency than the middle and end runners. Data collection chores were split by having Jack get the time the runner took from the third to fourth pole and by having me counts the steps run between the poles. Doing the calculations seemed complicated until after the race. Jack and I went to the telephone poles and paced off the distance between them, something like 80 feet. First we divided number of steps by number of seconds, then multiplied by 60 s/min, giving steps per minute. RESULTS: And all four group had about the SAME value of 182 steps per minute (STP). In each of the groups there were persons with faster and slower STP values; there was overlap. Very, very interesting! 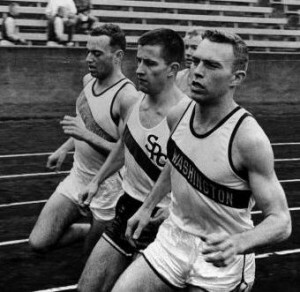 Of course, each of the faster groups averaged longer strides. CONCLUSION: Overall, with similar STP, a runner with longer running strides had increased leg power per stride, and this runner had faster speed. NEXT WEEK: Is there a relationship between running speed and brain power? One day last week, I put Perceived Effort to another test. Sure enough, as my right leg made the first double-step, I noticed that I was falling. Well, I also noticed my body sagging as I stepped. And then I felt a definite shift, as my body went to the left leg for the second double-step. Without thinking I pushed harder and arched my back to sorta leap over those next two steps. And a seemingly unconscious leap also happened for the third double-step using my right leg again. This time I did not arch my back. Whoa! What happened? How did this just happen!? Let me hazard a guess: if it was not seemingly conscious, then it was done subconsciously. Okay, then how? Perhaps “not falling on my face” mainly by using vestibulomotor and leg motor reflexes as like a musical score. Maybe the musical managing council was the subcortical locomotor control network comprised of the basal ganglia, the medullary and subthalamic locomotor regions, and the cerebellar locomotor regions. And the musical section leaders were the thoracic and lumbar locomotor regions making sure my arms were coordinated with my legs. Finally, my leg muscles compensated for the muscles in my overly bent right leg via were mediated by musical players in the hemi-spinal central pattern generators and their contralateral interneurons. Wow, what a modern neurobiological summary gifted by the works of Grillner et al. (2008) and la Fougère et al. (2010). And where is the word: “Effort”? Well, it is hidden in the phrase, “change my speed”. So, how do I know how fast I am going? Please tune in next week…..
Freyd JJ (1987) Dynamic mental representations. Psychological Reviews 94: 427-438. Grillner S, Wallén P, Saitoh K, Kozlov A, Robertson B (2008)Neural bases of goal-directed locomotion in vertebrates—An overview. Brain Research Reviews 57: 2-12l. la Fougère C, Zwergal A, Rominger A, Förster F, Fesl G, Dieterich M, Brandt T, Strupp M, Bartenstein P, Jahn K (2010) Real versus imagined locomotion: A [18F]-FDG PET-fMRI comparison, NeuroImage 50: 1589-1598. Siegel DJ (1999) “The Developing Mind” New York: Guilford Press. p 30. This is an educational website focusing on how to maximize long-distance performance and is published by Phil Weiser, PhD, FACSM (Emeritus). It explores the factors that limit endurance sports, the mechanisms that result in these factors, and ways improve your personal endurance performance. This site will be concentrating on middle- to long-distance running and cycling events. Phil is an experienced runner who has run a mile in 4 minutes 15 seconds and a marathon in 2 hours 29 minutes. Leg Fatigue: Hilly hikes really tire me! For Endurance Athletes, Is Stretching Counter-Productive? © 2019 Endurance Education · Proudly powered by WordPress & Green Park 2 by Cordobo.